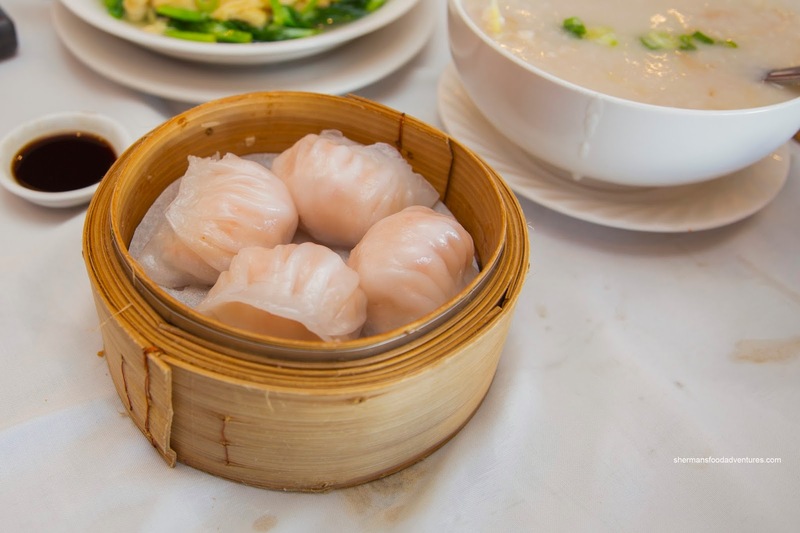 For awhile there, it seemed like we were doing Dim Sum at least a couple of times a week. It was so frequent that my kids began to complain about the repetitiveness. #firstworldproblems anyone? 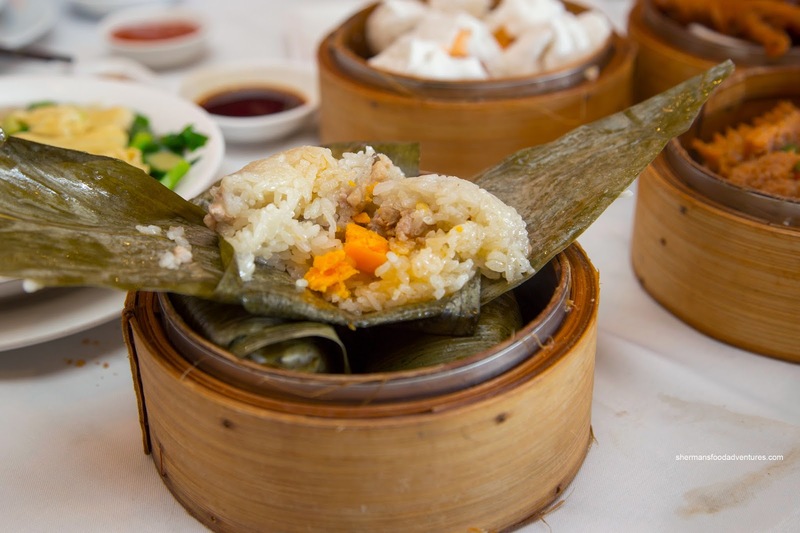 Honestly, I can do Dim Sum daily without much complaint. Well, after a 2-month hiatus, we finally decided to go back to the well. 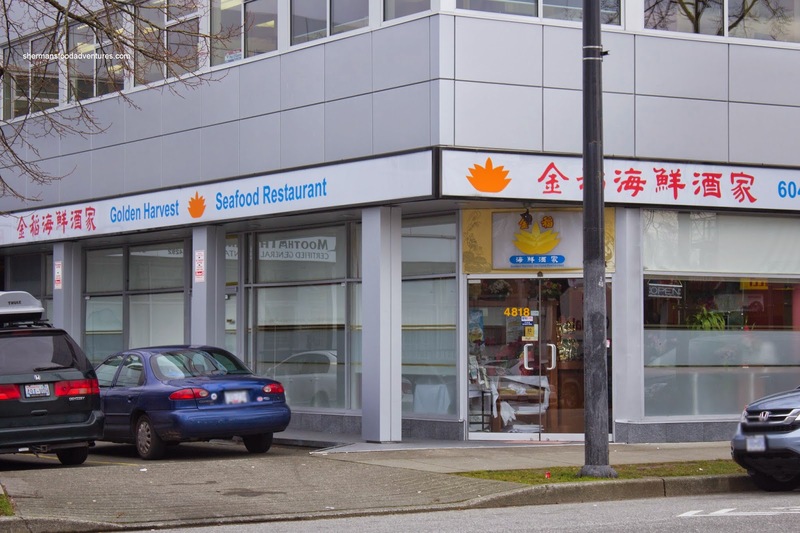 Seeing how I had to be out on Main Street, we headed to Golden Harvest (over Sun Sui Wah and King's since one doesn't provide good value while the other isn't that great). After a short wait, we were seated in a cluster of small tables which were packed really close together. Like our last visit, the table arrangement in the small restaurant was not done for comfort. 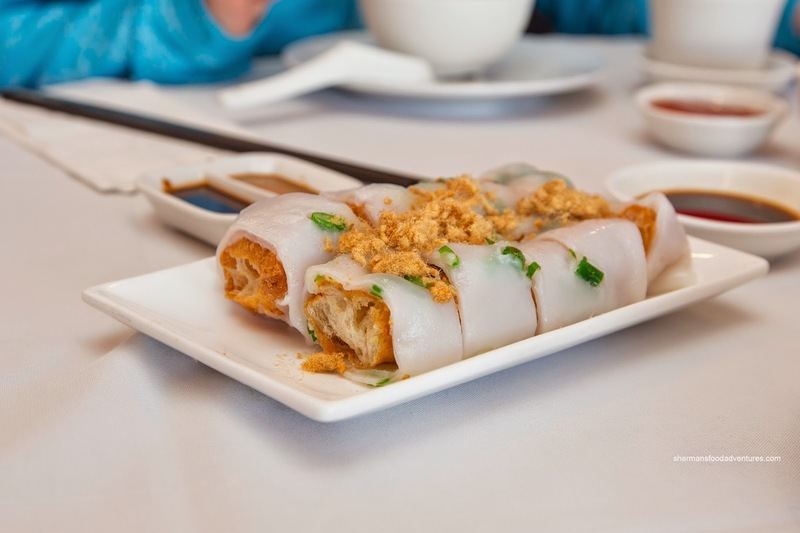 The first dish to hit the table was the Ja Leun (Salty Donut Rice Noodle Roll). Topped with some dried pork floss and riddled with green onion, this was a modestly-sized portion. We found the rice noodle to be on the thicker side, but not overly dense. The donut was not really all that crispy while still light. My son was not happy with all the green onion though. He was also not happy with the next dish as it was the Pea Shoots with bean curd sheets. 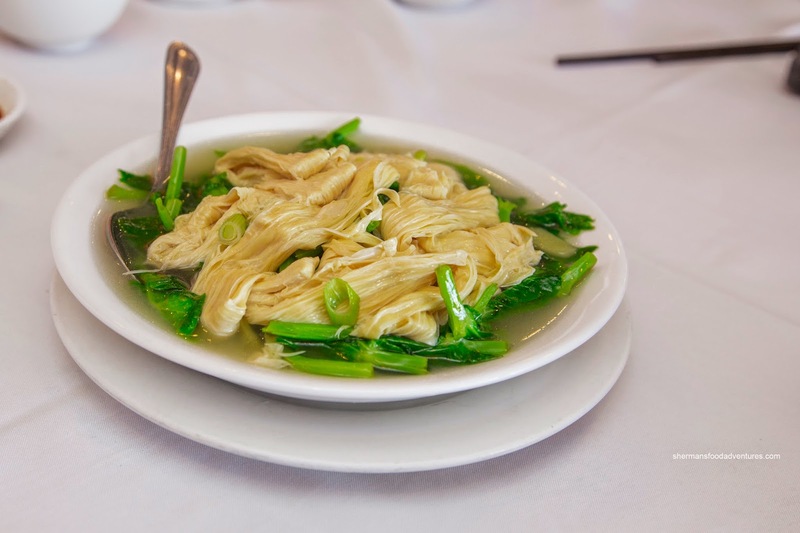 Served in a mild broth, the pea shoots retained a crunch while the bean curd sheets were tender without losing their chewy texture. After a little wait, the steamed dishes arrived all at once including the Phoenix Talons (Chicken Feet). 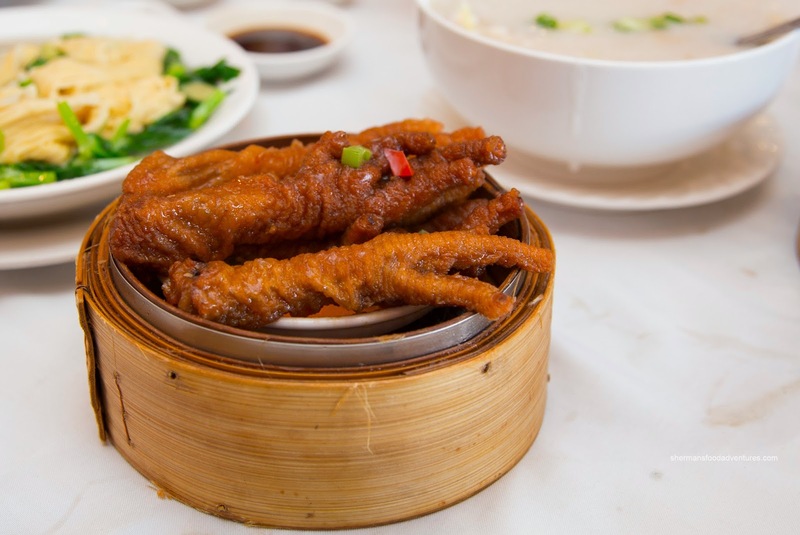 Large in size and plump, the chicken feet were well-executed. We found the skin to be soft with a gentle resistance. With softened cartilage underneath, the textures were appealing since there was little effort needed to clean off the bones (doesn't that sound delicious to you?). To top things off, seasoning was on point with a savoury garlickiness. Onto another dish the kiddies wouldn't touch was the Tripe and Tendon. Hey, they were missing out as the tripe was tender with a nice residual chew. Soft while not melting, the tendon were also appealing texturally. Like the chicken feet, the dish was garlicky with a touch of spice. Onto something the kiddies would eat, we got an order of the Mini Lo Mei Gai (Sticky Rice). These were filled with a good amount of ground pork, salted egg yolk and starch-thickened sauce. Hence, there was enough moisture and ingredients to flavour the soft, chewy rice. These were stuffed pretty much to the brim hence we didn't end up finishing the rest. 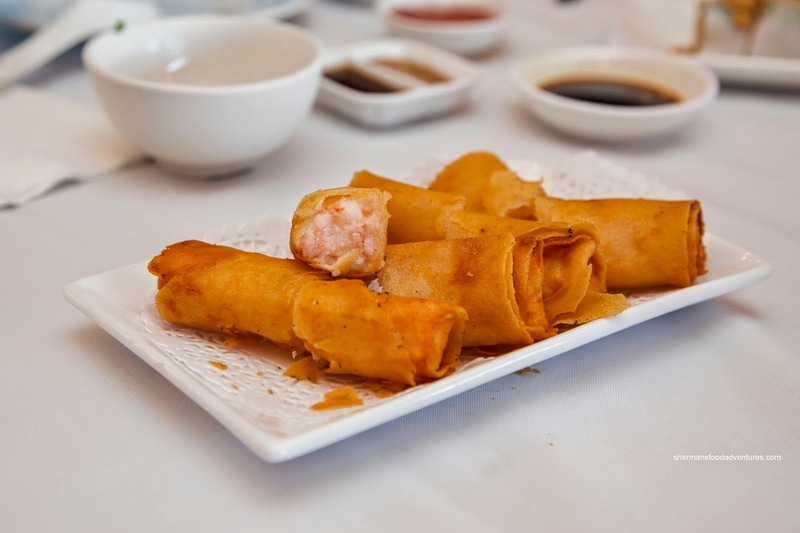 My son was pretty much ignoring us while he was busy with his 3DS-XL until the Shrimp Spring Rolls showed up. Yes, he finally looked up and helped himself to almost the whole plate. I was able to wrestle one piece away and figured out why he liked them so much. They were hot, crispy and easy on the grease. The shrimp were buttery with a mild snap while dressed in a whole lot of garlic. Moving onto some more kiddie favourites, we had the Chicken Congee with dried scallops, ginger and green onion. 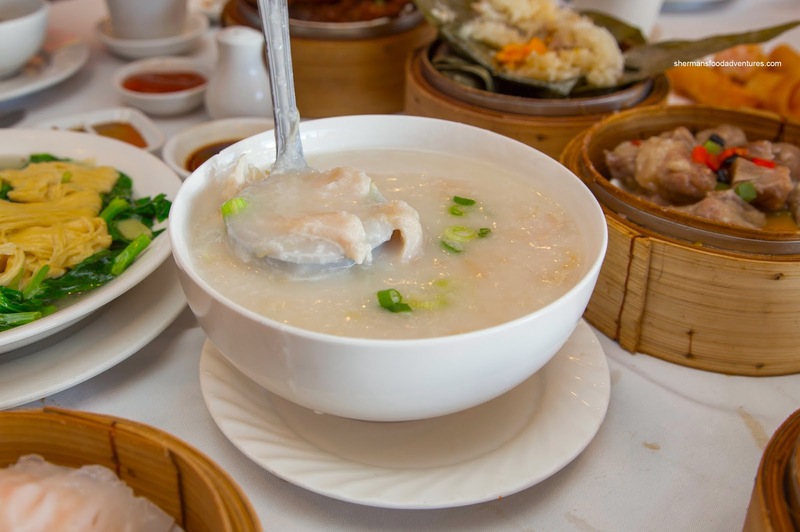 Even from the first spoonful, it was pretty evident that the congee base was far too thin and watery. Despite this, it was not over-seasoned, so we didn't get much of an MSG aftertaste. We liked the aromatic flavour of the dried scallops as well as the sweet slices of tender chicken. 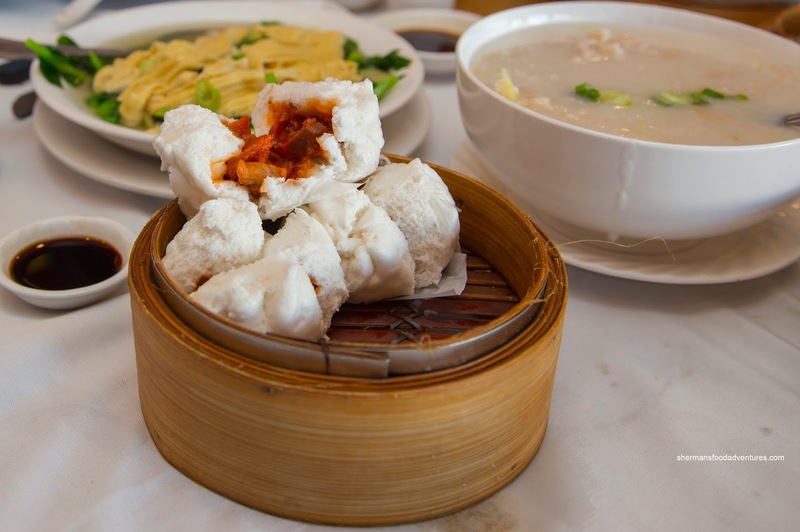 Next, they dug into the BBQ Pork Buns which featured a modest amount of lean BBQ pork within a light and sweet bun. The flavours were more savoury than sweet. We would've liked to see more pork though. 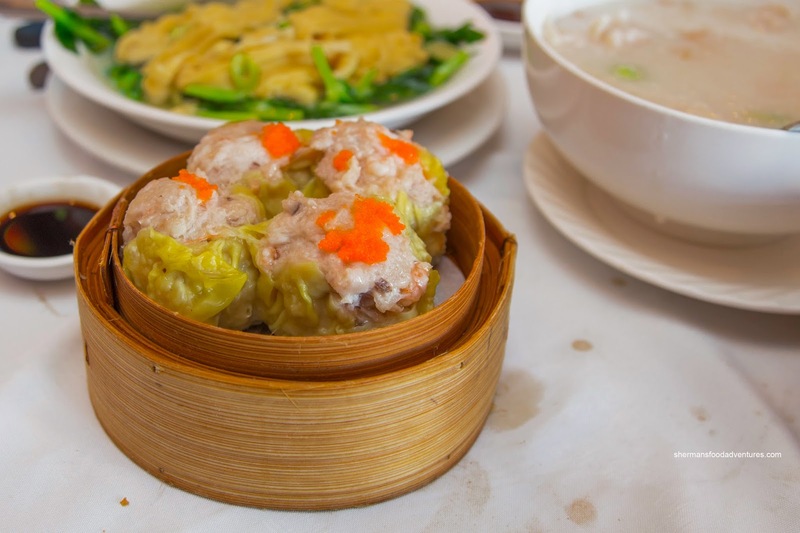 Nearing the end of the meal, we got the most important dishes of all - Haw Gow and Sui Mai. 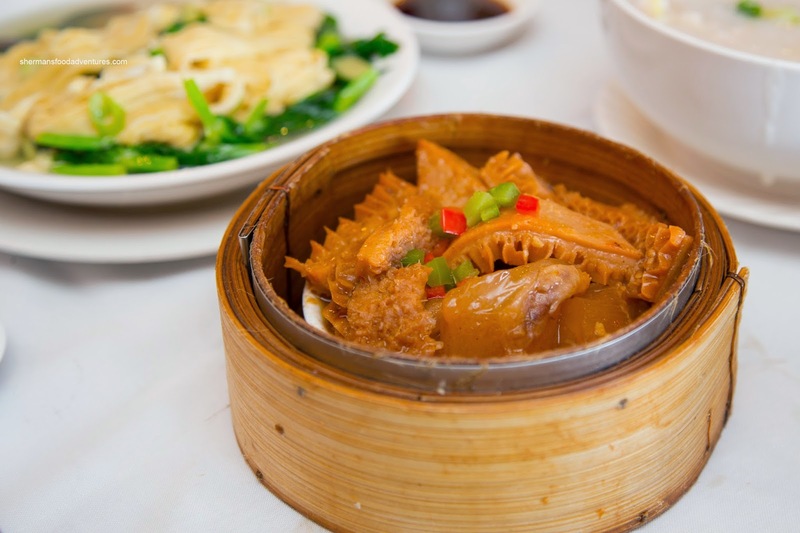 We found the dumpling skin on the haw gow to be of an acceptable thickness while being slightly chewy. Inside, the filling was too soft where it was lacking any form of snap. It was a direct result of more binding ingredients rather than actual big pieces of shrimp. It was rather bland too with not much in the way of sesame oil nor sweetness. On the other hand, the sui mai were much better being really large and plump. Inside, there was a mix of whole chunks of pork and shrimp. There was very little filler as it fell apart after a few bites. The texture of the pork was more meaty than bouncy while the shrimp did have a nice snap. We liked the balance of sweet and savoury elements. Lastly, we had the Steamed Pork Spareribs with black bean and peppers. 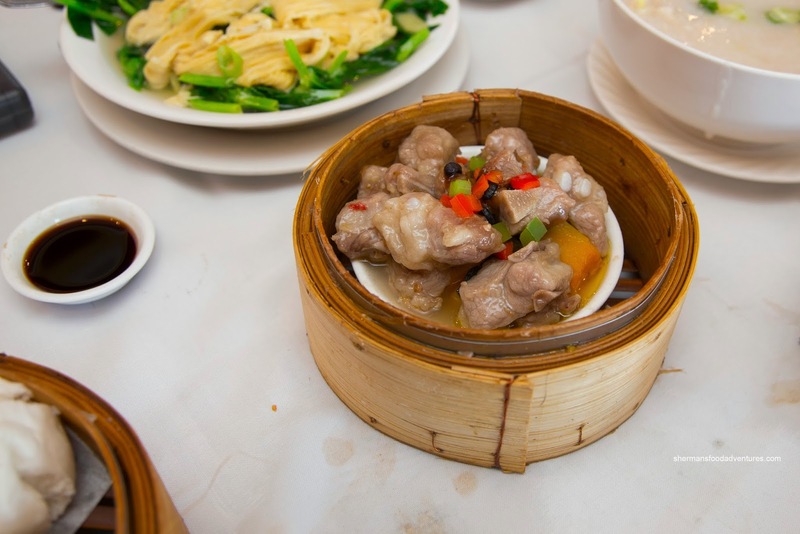 Similarly textured like the pork in the sui mai, there was a meaty chew. With that being said, it wasn't hard to eat though, yet the pieces were a bit too big. We thought there was a good mix of rib and cartilage pieces. In terms of seasoning, it could've used more garlic and salt. Much like the last time we visited Golden Harvest, the food was pretty decent overall. Prices were fair and the service was acceptable.